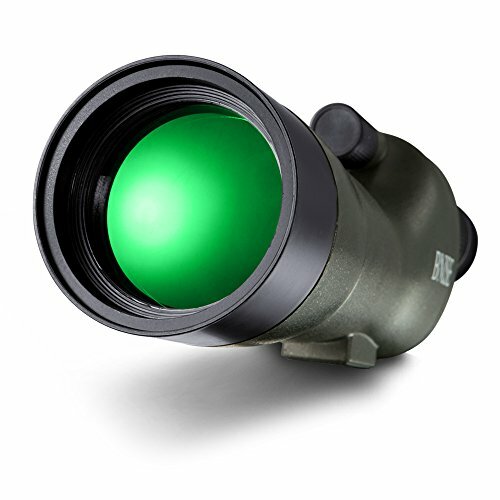 BNISE Spotting Scope 20-60x60 Zoom Monocular | Spot On! Features: BK-7 prism for bright, clear, crisp viewing. Waterproof fogproof spotting scope with tripod, Ideal for all-weather conditions. Scope’s 20-60-x60mm design gets you up close and personal Multi-coated optics and massive objective lens increases light gathering ability thus delivering Brighter images in low light conditions Fully coated, high-quality optical glass for bright, sharp, images in full detail Wide range of magnifications and configurations Convenient and portable as includes tripod, soft carrying case and premium hard side aluminum case Specifications: Model:BNISE-1112B Magnification: 20 to 60x Objective lens: 2.36 inches (60mm) Eyepiece Coating: FMC wide broadband green film Waterproof: nitrogen waterproof Focus System: Independent Focus Exit pupil distance: 0.67-0.53 inch Exit Pupil: 0.11 inches (20X), 0.03 inch (60X) Focusing distance: 6M Prism system: BAK7 Size: about 14.2inch x2.95inchx4.1inch Weight: 1.65pounds Color: Army Green Package Includes: 1 x Big eyepiece Telescope 1 x English Brochure 1 x Carrying Case 1 x Triangular bracket 1 x Camera Photography Adapter (for Canon Camera use only ) 1 x Phone Photography Adapter (for any phone width less than 90mm ) About BNISE: BNISE is a high-end brand in the field of optical; BNISE has devoted to professional design and production of optical high-end products more than 20 years and the factory has more than 100 professionals in the optical system design and research, thus ensuring the strong technical background and development ability in high-end advanced optical technology in optical field; BNISE hopes to provide higher quality, better service, and life-time durable optical products for consumers.